October may be peak smartphone season but it’s also an exciting time for tablets. So far this month we have seen the Microsoft Surface Pro 6 and the Google Pixel Slate, while on October 30 Apple will be announcing its new iPad Pro line. However, today it was Samsung’s turn to announce its own competitor. Starting with the exterior design, the front of the tablet remains largely unchanged from the previous device, the only noticeable difference being a slightly more rectangular shape – despite the recent trend towards bezel-less designs, Samsung hasn’t made much of an effort in this department. Over on the rear, some major changes have been included, although the look isn’t exactly unique. In fact, the new Galaxy Book 2 looks suspiciously similar to the Surface Pro 6 thanks to the addition of a new built-in aluminum kickstand. When it comes to the actual tech specs, the Galaxy Book 2 comes equipped with a large 12-inch Super AMOLED display which boasts a resolution of 2160 x 1440p and is paired with two AKG-tuned speakers. Internally, Qualcomm’s Snapdragon 850 can be found, as can 4GB of RAM and a 128GB SSD. Other details include two USB Type-C ports, a 3.5mm headphone jack, Windows 10 with S Mode activated, and a weight of 1.75lbs. Interestingly, Samsung has not confirmed the exact battery capacity. Instead, it is following in the footsteps of Apple by simply stating an expected battery life of up to 20 hours on a single charge. Pricing and availability-wise, Samsung has confirmed that this particular Windows 2-in-1, along with its include keyboard cover and S Pen, will retail for $999.99 in the US. 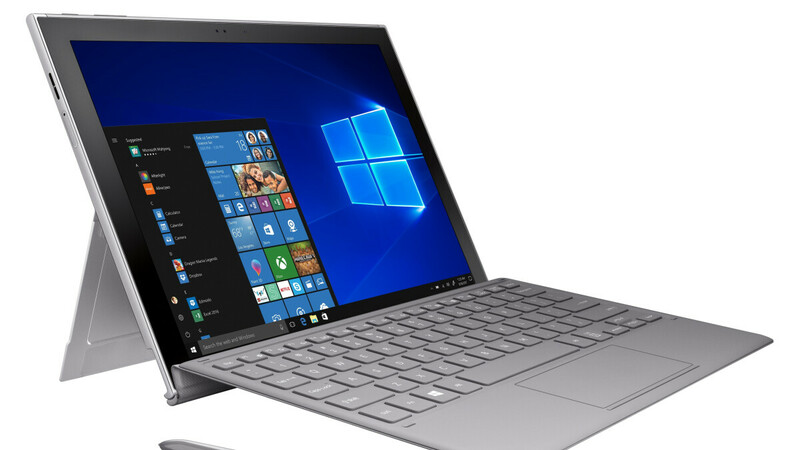 Starting November 2, it will be available through the official Microsoft, Samsung, and AT&T websites, although later on in the month consumers will be able to pick it up at local AT&T, Sprint, and Verizon stores, all of which will be offering the Galaxy Book 2 with LTE plans. Well, it is Phone Arena after all but I get what you're saying. If it's not an iPad nobody cares. BTW, those first SD tablets you mentioned use 835s. This 850 is a first. Well, the comment I reply only said "snapdragon windows devices", He never mention the version. Weak chipset. After a year of owning this device you will notice slow downs. Connectivity is great along with a super fast SSD and RAM. This "weak" chipset was just announced and this particular tablet will be the first one using it in the US. WTF are you smoking? You do realize this a Windows device, not Android. Do some research before writing. Even i3 CPUs are more powerful than flagship Qualcomm chipsets. Performance takes a big hit here. Read all other reviews where Windows 10 laptops(tablets) run on Snapdragon processors. He is right, this processor is too weak to run Windows. Learn some more reading comprehension skills. I'm not debating a Qualcomm chip is inferior to an Intel. What I have a problem with is people playing Nostradamus without any empirical evidence to back it up. Newer doesn't always equate with better but you don't know that until there's been a sufficient sample size to gauge by. There's nothing to be gained by reading reviews of previous versions of anything. Have you ever spent any time with a PC running S Mode? My guess is no otherwise you'd know that it runs Windows very well. Not because The Verge says so, but because I've been using it for more than 6 months on a daily basis. S Mode was developed specifically for mobile chips like the SD835. The test mule was an HP Elite x3 phone last year. Maybe it's you who needs to do some research before writing. They say it's better to keep your mouth shut and have people think you're an idiot than to open it and remove all doubt. GB4 scores of 2200/6900 on the snapdragon 850. It's equivalent to an A10 chipset. Running an ARM chipset on Windows may not be strikingly fast over the competition. Samsung should have waited for the Exynos chipset instead. The only saving grace of speed performance bumps are the SSD and RAM. Again after awhile of ownership you will notice some slow downs. Well the A10 scores 3600 on single right now. The GB score is low because it's run via x86 emulator that windows uses for running x86 apps on arm64 architecture. Native arm64 apps will run well on windows for arm. But most popular windows apps are all x86, so they run slowly on windows for arm. Weak? First off why would you even compare an Intel chip to SnapDragon. But yet I've seen fanboys claim Apple chips are faster than Intels, when they are not. They aren't even close. Because RISC and CISC are way different processes. An ARM chip of any kind does not have the muscle to pull heavy coding. It's not about clock speed and cache. It's about code. But Windows S is a lighter coded Windows that is as fast or faster than any Android or Apple based option And the fact you can run X86 apps is awesome because they provide options you dont get with ARM. The SD is powerful enough for general Windows tasks like email, web browsing, Office and similar light tasks. It wasn't designed for heavy lifting like converting a 4K movie to 2K, or heavy photoshop tools and editing. You guys know nothing about tech and always trying to pretend. In fact, the fact that you continue to compare everything to Apple shows you dont know a frickin thing. The iPad and Android tablets are toys compared to anything with an X86 based chip inside. When phones have 6-8GB RAM, why put only 4 in a tablet? Why would anyone want to buy this when you can get the 5th generation surface pro for the same price...... and that one has an i5 processor and 8gb ram..... Ive seen so many surface pro discounts lately. And with black friday around the corner there will be more.